So what have I been up to yesterday and today? Well, yesterday was an amazing day here weather wise, and I couldn't have picked a better day to be without the van - it was booked in to have a CV boot replaced, and have a general once over before the trip. The CV boot replacement was going to be tricky to attempt alone because I'm not tuned in with how to remove the free wheeling hubs on the front axles. So anyway, I was about on my bike all day in the sunshine, and enjoying the laid back atmosphere around the university area in Belfast. I had a good few hours to wait for the van and it couldn't have been a better way to spend it than cycling about, relaxing somewhere a while, then cruising off somewhere else. 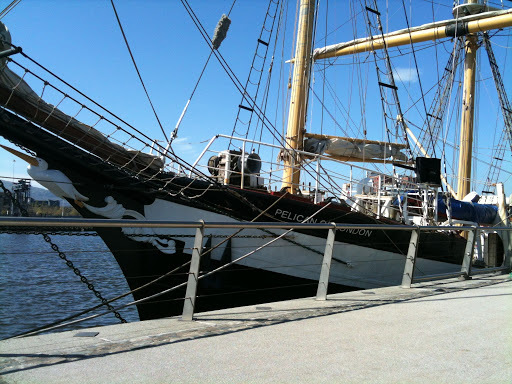 I checked out the tall ship 'Pelican' still moored in the harbour from the weekends maritime festival, and hung out a while near the Titanic centre, watching roller bladers. Yesterday evening I met a friend for a meal and a glass of wine in Carrickfergus, then another friend joined us and we went for a spot of fishing on the end of the harbour. We didn't catch anything - probably as the tide was very low at the time, well thats my excuse anyway. The rod I had repaired was performing well in casting so I was pleased about that. I then headed into work for my last shift - a night shift, oh well.. This morning I stayed up, and headed 'round to see the guys at the National Trust Belfast, where I've been volunteering since last October doing a bit of conservation and park maintenance work. I hadn't seen them in a week or two, so it was good to get to see them before I leave, and to hear the latest news. I'd like to thank Craig, Colin, Mick, and Thomas for all the good times over the winter and spring, and for the skills I learned there, and their warmth and friendship too - thanks guys! 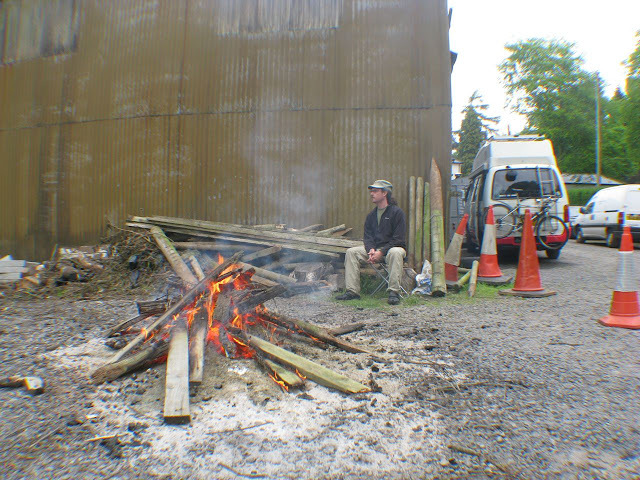 I ended up today with the best job possible for my last day volunteering there (and my first day of freedom from my main work) - keeping a bonfire going throughout the day, getting rid of some old rotten fencing materials. Also a perfect way to pass the day after a night shift. Another memorable time at the National Trust centre.. I also had plenty of time while doing this to reorganise things in the van, and set up some of the electrical outlets in the most accessible way for being on the road. I've also set up a storage place for my laptop, where its out of sight, and is always being charged while the van engine is running - if I always put it away in this place, I won't forget to plug it in, and it'll always stay charged up. I ran a cable from the dash cigarette lighter socket to the laptop storage place. If I want to charge it from the solar system, I can plug it in the back instead, but this way it won't be draining my aux battery when I stop the engine. Whats your most memorable or enjoyable day of work? What is it about a campfire that makes it so relaxing and satisfying to sit by it? Let me know your thoughts.. Thanks for visiting! If you've any questions please share them below.